I *hope* none of my readers are broke at 35, though something tells me that, with the building mountain of student debt and poor job prospects post-2008, there are some. I’m a fan of this blog, which sets out some very basic common-sense approaches to building some net savings 10 years after university graduation. Once you’ve reviewed the spending principles, head back to mine for basic savings principles. Just a quick shout out to one of my favourite blogs, The Simple Dollar. Yesterday’s entry on how to retire on $1 million (or if it can be done) well-illustrates the type of basic analysis underpinning retirement planning calculators everywhere. My only caveat with the analysis, like most of these simple ones, is the sensitivity to assumptions. This article tries several types of assumptions, which makes the thing stand out (in my opinion). But particularly when long time periods are involved, small changes in assumptions can drastically change results. Given we have basically no idea what the correct figures will be, caveat emptor for those placing too much reliance on one run of the ‘simulation’! Sadly there isn’t a good fix for unknown parameters in the analysis, but rest assured I’ll let you know when I have a reliable crystal ball. Interest rates are all the rage these days in the media: various countries are cutting base rates to below zero (an idea once thought impossible, called ‘the zero bound’). The latest culprits are Scandinavian countries Sweden and Denmark – their economies are closely tied with the Euro-area, so the quantitative easing from the latter increases pressure on the Scandi countries’ exporters. Enter negative base rates. Longer-term interest rates have fallen as well, with multiple governments now able to borrow at near-zero for 10-year loans. With all this in mind, let’s consider the big picture, and implications for individuals. Definition: an interest rate is the cost to the borrower for getting money now, rather than later. Seen from the other side, the interest rate is the return to the lender for giving up money now, rather than later. The interest rate is an example of carry, or the return to an investor for holding an asset (in this case, a loan/bond). Usage: we can use the interest rate to help judge one debt versus another. Payday loans: around 400% interest per year. No security needed, and very short term. Credit cards: around 15% interest. No security needed, and short term (balances can be rolled forward, as long as credit card company allows). Peer to peer loans: around 10-15% interest. No security needed, and medium term (3-5 years). Student loans: around 5-10% interest for Federal loans; 7-15% for private loans. No security needed, though sort of the ultimate security: you can’t get rid of these loans through bankruptcy. 5-15 year term. Home equity loans: about 6% interest. They’re 2nd mortgages on your house. 5-15 year term. Auto loans: around 4% interest. Car title held as security; medium term (3-5 years). Home mortgage: around 3-4% interest. House title held as security; long term (15-30 years). In the US, mortgage interest is tax-deductible at your highest marginal rate, so the effective interest rate may be much lower. In sum: if I had several types of debt outstanding, I would probably pay them off in the order above. If I needed to borrow, I’d probably borrow from the bottom up. Savings account: about 0-1% interest. Instant access, and government-insured. Certificate of deposit/fixed savings: 1-2% interest. Government-insured. 1-5 year term. Government bonds (Treasuries): 0-2.5% interest. Government-issued. 30 day-30 year term. Corporate bonds: 1-6% interest. ‘Proper’ credit risk – you may not get back what you put in. Typical 5-year term. Peer to peer lending: 5-15% interest. Lending to ordinary folks, with no collateral. 3-5 year term. In sum: pick your poison. If you need the funds at any time (e.g. an emergency fund), better to stick with the earlier entries on the list. If you’re looking for more risk, head on down the list. Keep in mind rates are at all-time lows in most places, so maybe keeping with short duration (i.e. sticking with shorter-term stuff) is a safer play. There you go. Other types of carry (e.g. dividends, rental yield) we can pick up later. Begin at about 21:30 if you’d like to skip an opening session on starting a business (including the vocabulary around accounting and capital markets). The second half is purely focused on investing. Mr Ackman speaks of mutual funds being the obvious solution for those not wanting the effort of choosing their own portfolio companies. I’m sure he wouldn’t begrudge me a pitch for ETFs which do the same things, but usually carry lower fees. Given Mr Ackman’s value-oriented investment approach, I wasn’t surprised to hear his cynicism for investment styles outside of value (namely ‘technical’ or systematic approaches). I disagree here, noting that both Mr Ackman’s approach and other approaches can work in the long term, and frequently provide different sorts of investment returns. Let’s talk rebalancing the portfolio. Most personal finance websites/books/etc. focus a great deal on trade entry; less on trade exit; and usually even less on ongoing maintenance/rebalancing. Compared with finding ‘the next Google’ or ‘signs to move to cash’, the monthly/yearly rebalance seems pretty boring. However, rebalancing is very important to a long-only portfolio performance. Broadly: a long-only portfolio comprising some mix of assets will, over time, become dominated by the best-performing asset. The usual example is: a mix of equity/bonds will become more and more invested in equities, given their outperformance long-term. If you don’t rebalance, you are implicitly creating a momentum portfolio – more investment in winners than losers. While this may have some merit as an idea (I like momentum), the diversification of the portfolio goes into the toilet. The portfolio becomes a one-way bet on equities. Constant mix – the boilerplate, constant proportions of (say) 60% equities and 40% bonds. Buy-and-hold – the set and forget approach. Buy on day 1, then never rebalance. What I’m warning about above. Constant Proportion Portfolio Insurance (CPPI) – Somewhat the opposite of constant mix, this is a fairly explicit momentum strategy. Equities get an even larger allocation than buy-and-hold as stocks rise. The kicker is this: CPPI trades off between a ‘risky’ asset (either 100% equities, or maybe a 60/40 portfolio??) and a ‘riskless’ asset (e.g. cash or T-bills). So the idea is that you put on more risk as risky markets perform well. Time-based – probably the most common approach. Every month/quarter/year you look at your statement, then rebalance to your target allocation. For #1 above, you go back to the original 60/40 split (or whichever mix you’ve chosen). For #3, you use a formula outlined in places like this. Error-based – for those keeping closer attention to the markets: rebalance back to target whenever the realised allocations stray beyond a certain tolerance. Rebalancing is absolutely necessary. Buy and hold is consistently beaten by rebalanced portfolios. However, rebalancing need not be too frequent. I’ve read the best results from rebalancing no more than quarterly, when holding an all-securities portfolio (NB: if you’re using options, a monthly rebalance is worth the effort). Annual rebalances are a good rule-of-thumb. Buy-and-hold – initial purchase of stocks and bonds remains unchanged throughout the time period. 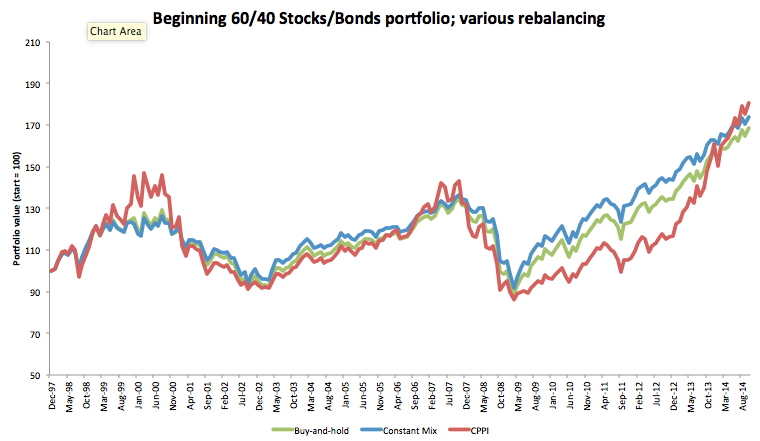 Constant mix – portfolio is rebalanced to 60/40 at the end of each month. Notice that, over this period, the constant mix slightly outperformed buy-and-hold, despite equities outperforming bonds handily in the period. We must be capturing some mean-reversion among the two asset classes. CPPI – the portfolio is rebalanced according to the following parameters: multiplier of 3; cushion value (Treasuries used as cushion) of 80. Rebalance occurs at each month-end. Notice that this is a much more aggressive rebalancing technique than the others; due to the equity outperformance, especially in the past few years, this ends up being the best relative performer (albeit with much higher volatility). Finance 101: Slight diversion…Let’s play a game! Now the components of a saver’s portfolio have been outlined, let’s talk a bit about putting a few parts together. Don’t risk ruin. I value sleeping well, so at no point could my investments go to zero or below. That means (for those reading the extension lesson last time) never holding unlimited risk positions, keeping leverage at a reasonable level, and always holding a significant portion of cash. Diversification is king. Hopefully I’ve convinced you by now. I like having multiple types of return sources in my portfolio, so that my net worth doesn’t whip around like the stock market. We’ve had the benefit of 2008 to learn that not all diversification is real (e.g. all hedge funds proclaimed they’re diversifying to equities, but that argument was proven very wrong). This concept also means I need to keep on top of my investments, as sometimes what used to be diversifying is no longer. Minimise costs. Market returns are extremely uncertain, but costs are completely controllable. If I can achieve the same type of return stream with lower cost, I’m there. BTW, I do still believe there are some superstar managers in super-diversifying sectors which deserve high fees; I just can’t afford them! Be lazy, yet systematic, as possible. I would like a portfolio which requires maintenance (e.g. rebalancing) roughly once every few months. I keep a picture of my desired allocation, and rebalance when necessary at those points. That being said, I’m stretching the truth in my personal situation, as I’ve gone a few steps further. But for the vast majority (99%+), having a relatively stationary portfolio is key. So what are the basic ingredients for our beginning portfolio? Cash: I am a subscriber to the idea of holding an emergency cash stash. Opinions vary, but I would keep as much as needed set aside to feel comfortable if and when everyone in the family loses their jobs, and the financial markets are in the toilet. Probably 3-6 months of expenses, with more if you live in an ‘at will employment’ country (e.g. the US!). Advice for those working in the financial sector: keep more cash, as your job prospects are directly proportional to rising financial markets. Equities: in particular, index ETFs. They fit the points above perfectly – low cost, diversified, automatically rebalance. Diversifying across geographies is a good idea – for example, US stocks are currently trading at a much higher valuation than the Rest of the developed world, so maybe worth buying some of the RoW. Bonds/Treasuries: hmm. Why do we usually have bonds in the portfolio? They usually perform well (Treasuries, in particular) when stocks perform poorly. They pay recurring interest – ‘carry’ is good, for the most part. They have lower volatility than equities…mostly. In sum, we should probably have some bonds in the portfolio. However: remember that interest rates are near all-time lows, so carry isn’t too great, and bonds can’t offset equity losses as well as in past. I’m currently massively underweight bonds in our portfolio, replacing bonds with extra cash and a managed futures mutual fund. I’d use ETFs instead of buying underlying bonds, given illiquid bond markets. What proportions of each? One of my favourite bloggers/fellow individual investors wrote a great post on creating a low-effort ETF portfolio, with the goal of equalising risk between equities and bonds. A good start, methinks, for all the cash you don’t squirrel away in the emergency fund.